In April 2014, the New Museum hosts the first museum presentation of work by Jeanine Oleson, who will produce an exhibition, several public programs and workshops, a publication, and an experimental opera over the course of a four-month residency during the Museum’s 2014 spring R&D Season: VOICE. During her intensive residency at the New Museum, she will develop a group of interrelated new works, constituting an exhibition, public programs, workshops, a publication, and an experimental opera. An exploration of different kinds of voices—from the musical voice of opera to political acts of speech—Oleson’s project both investigates language and points beyond it. Looking for alternative models, “Hear, Here” asks questions such as: How can we attune ourselves to each other? Where is the agency in language? What does it really mean to listen? The foundation for these queries resides within art itself—particularly in relation to issues of audience and embodied engagement, in addition to objects and conditions that alter modes of expression—in order to respond to larger political and cultural problems faced on a global level. In this context, during the run of the show, Oleson is developing a video installation for the Museum’s Fifth Floor gallery that investigates conditions of spectatorship. The set and objects for an experimental opera (to be staged in the New Museum’s Theater, June 13–14) will be present during the run of the exhibition, forming an impromptu stage set or catalyst for a series of informal programs in the gallery space leading up to the final performance. Accompanying the exhibition is an archival and research-based presentation by Oleson in the Resource Center that takes up questions around various registers of Voice. 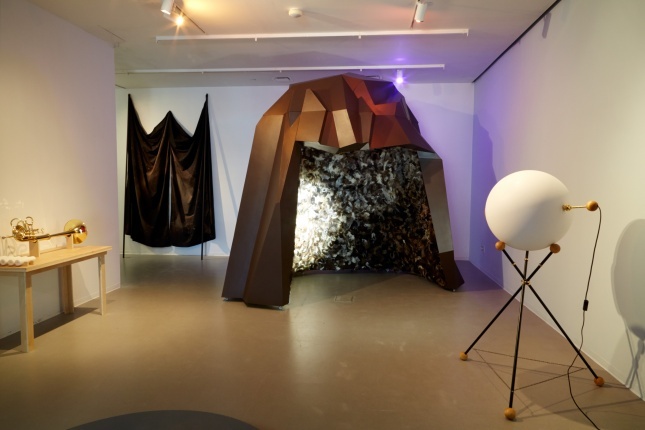 Centering on a paradoxical landscape—a mountain that is also a cave—the exhibition and its constantly shifting elements (including musical instruments, staging tools, and performance artifacts) produce a reactive space that focuses on the politics of vocalizing perspectives and the necessity of participation in lived experience. All the while, the affective role of voice in Oleson’s work mobilizes a mix of humor, rancor, and joy in addressing an avalanche of pressing issues in contemporary life. 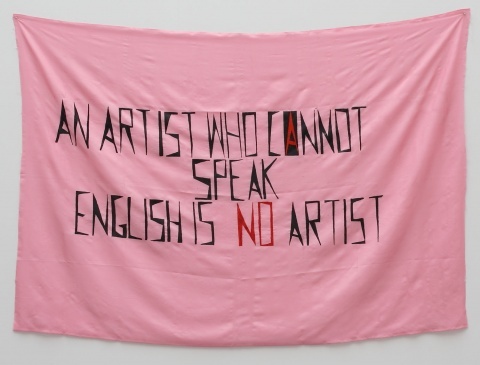 “Jeanine Oleson: Hear, Here” is on view at the New Museum from April 23 to July 6, 2014, and is curated by Johanna Burton, Keith Haring Director and Curator of Education and Public Engagement. Jeanine Oleson was born in Astoria, OR, in 1974. She attended the School of the Art Institute of Chicago, Rutgers University, and Skowhegan School of Painting and Sculpture. Oleson has exhibited and performed at venues including: Exit Art, NY; Beta Local, San Juan, Puerto Rico; X-Initiative, NY; Grand Arts, Kansas City, MO; Socrates Sculpture Park, NY; Diverseworks, Houston, TX; L.A.C.E., Los Angeles; Monya Rowe Gallery, NY; Samson Projects, Boston, MA; Gallery 400, University of Illinois at Chicago, IL; John Connelly Presents, NY; Bates College Museum of Art, ME; H&R Block Artspace, Kansas City Museum of Art, MO; Participant, Inc., NY; MoMA P.S.1, NY; Santa Fe Art Institute, NM; Pumphouse Gallery, London; White Columns, NY; and Art in General, NY. Oleson has received a Franklin Furnace Fellowship and a Jerome Foundation Travel and Study Grant in 2009; a Brooklyn Arts Council Community Arts Regrant (2008 and 2009); and a Professional Development Fellowship, College Art Association (1999–2000); and was in residence at Smack Mellon Studio Program, NY. She also published two books about performance projects in 2012, “What?” and “The Greater New York Smudge Cleanse.” Oleson is an Assistant Professor of Photography in the Department of Art, Media, and Technology at Parsons the New School for Design. She lives in Brooklyn, NY. “Jeanine Oleson: Hear, Here” is made possible, in part, through the support of the New York State Council on the Arts and the New York City Department of Cultural Affairs. The curator would like to extend a special thanks to the Foundation for Contemporary Art, Parsons The New School for Design, and Dazian Creative Fabric Environments.